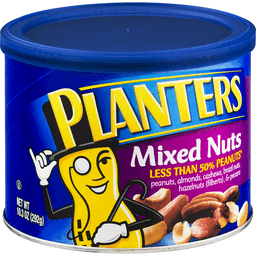 Planters Mixed Nuts. Less than 50% peanuts. Peanuts. Almonds. Cashews. Pecans. Brazil nuts. Per 1 oz. 170 calories. 2g sat fat, 10% DV. 85mg sodium, 4% DV. 1g sugars. Contains product from: Bolivia, Brazil, India, Ivory Coast, Mexico, Nigeria, Peru, U.S.A., Vietnam. Kraft Heinz. Please have package available. For best when used by information please see date printed on package. Please include code number from bottom of can in all correspondence. Visit us at: planters.com. 1-877-677-3268. ©Kraft Foods.